1917: Launched by Dundee Shipbuilding Co Ltd, Dundee (Yd.No.279) for the The Brooklyn Fishing Co Ltd, Fleetwood as AUREA. 25.9.1917: Registered at Fleetwood (FD300). Thomas Cardwell, designated manager. 9.1917: Completed. Requisitioned from the builders for war service and fitted out for anti submarine duties (1-12pdr, 1-3.5” A/S Howitzer and Hydrophone) (Ad.No.3066). Based Aegean Sea. 12.3.1919: Waiting instructions whether required for Post-War Service (SS). 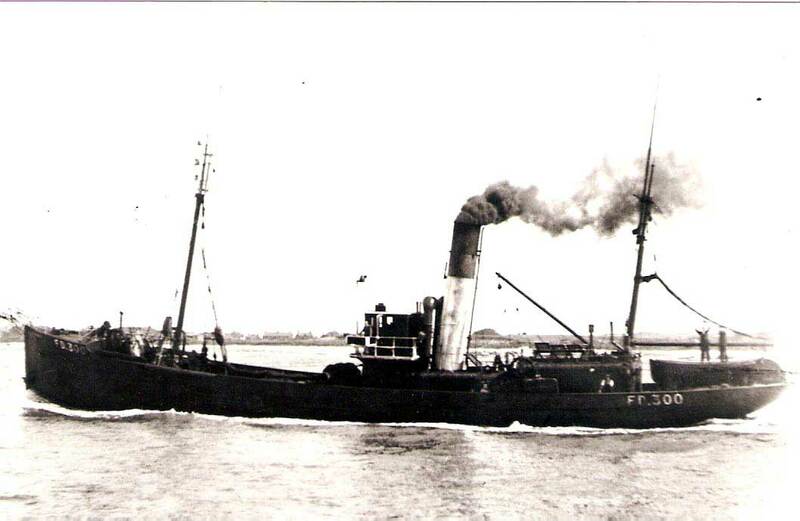 22.01.1922: Arrived Killybegs, Co. Donegal with steam trawler ASHLYN (FD1) picked up disabled whilst fishing the Donegal Bay grounds. 11.1928: Fishing the St. Kilda grounds (Sk. Ashton). In heavy weather, whilst the crew was preparing the gear, the skipper saw a huge wave approaching and shouted from the wheelhouse to the men below, ‘Look out lads, hang on”. The wave struck the ship which lurched and deckhand Robert Simms (50) who was running aft for shelter was struck by the wave and carried overboard. In spite of the sea conditions Sk. Ashton turned the trawler in the direction of Simms, who twice shouted for help and with the aid of a boat hook a hold on Simms was obtained. The skipper clambered down the side and with assistance pulled the man back on deck. The manoeuvre had taken about seven minutes and immediately artificial respiration was commenced and continued in relays for three hours but the efforts failed. 27.11.1928: At Fleetwood and inquest was held into the death of Robert Simms and a verdict of accidental death was recorded. 1934: Sold to T. L. Devlin & Sons, Granton. 4.1934: Registered at Granton as COMPAGNUS (GN2). Thomas L. Devlin designated manager. 29.12.1934: Mate, Gilbert Menzies, badly injured when blocking up. Taken to Leith Hospital. 13.12.1935: About 140 miles off Aberdeen connected to trawler NAPIER (A244), disabled with engine problems and delivered Aberdeen. 1.11.1938: Sailed Granton for the fishing grounds. Called at Aberdeen about midnight and the skipper reported one of crew missing. The skipper was under the impression that he had left Granton with a full crew but when inquiries were made at Granton it was discovered that the “missing” man had gone ashore unknown to the skipper just before sailing. 17.12.1939: Foundered in the North Sea, 150 miles E by N of May Island, Firth of Forth after being bombed and damaged by German air attack; one deckhand, James Swanney killed by machine gun fire, Ch Eng Joseph Sim and Deckhand Arthur Orr both injured. Survivors taken onboard steam trawler COLLEAGUE (GN53). 25.05.1940: The Scotsman; Deck-hand James Swanney (deceased), trawler Compaganus (Thomas L. Devlin & Sons, Edinburgh) is commended for gallantry. During an enemy aircraft, attack upon the trawler, Swanney went on deck to try to cut away the fishing gear and was killed by machine-gun fire. He did his best to save his shipmates without thinking of his safety. 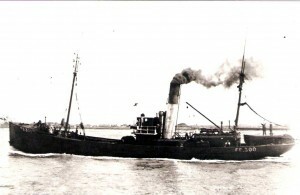 This entry was posted in Lost Vessels, Steam Trawlers, Steamers (Picture), War Losses and tagged Brooklyn FC, Lost, War Loss on May 17, 2012 by Fred Smith.